British rock band Ryders Creed will be plugging songs from their self-titled debut album at their only show in Derbyshire during a UK tour. They play at The Globe, Glossop, on October 27, following a string of summer festivals and headline shows. 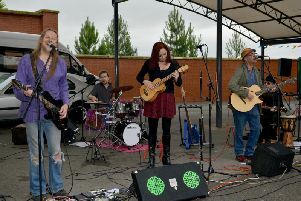 The band comprises Ryan Antony on vocals, Lee Spencer on guitar and vocals, Myles Cooper on guitar and vocals, Richard Clark on bass and Lee Gilbert on drums. Their songs draw on diverse influences from the likes of AC/DC, Black Sabbath, Clutch and Monster Truck.